A new seal of approval program to recognize sites operated in accordance with the GPWA code of conduct is being launched this month. The program is designed to establish credibility for deserving websites through the use of a "GPWA Approved" seal linked to a confirmation page that authenticates the seal and explains what it means. 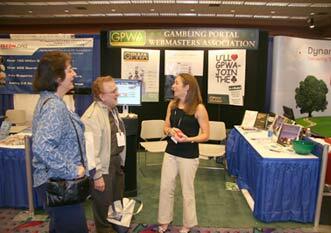 A completely new and revised directory of GPWA member portal sites is now available on the GPWA website. The new directory includes features such as the GPWA members affiliated with the site, the game focus of the site and the Alexa rank of the site compared with other GPWA member sites. A completely new and enhanced member directory has also been released. It includes a complete list of portal sites as part of each member's profile page. We hope this will help members work together to an even greater extent based on being able to associate members and their portals. The GPWA exhibited at Pubcon held at the Las Vegas Convention Center last week. We had a successful membership drive at the show, with more new member applications currently being processed than at any time in GPWA history. We've developed a new eight-page saddle-stitched booklet that shows all of the great new benefits of being a GPWA member. We gave hundreds of these booklets away during our membership drive at the Pubcon conference. Take a look at the brochure online in pdf format. The complete Conference Guide and Member directory that was distributed at the GPWA conference in September is now online. The 78 page pdf file includes a directory of GPWA members, GPWA member portal sites, and GPWA sponsor affiliate programs in addition to conference information like the agenda, speakers, and sponsors.
. This is the common value every Webmaster shares. All too often we turn a blind eye to the sad truth. For those capable of helping I feel moral obligation/imperative to do so. Turn a blind eye you may become blind. read more"
Any Cheap Hosting in the UK? GPWA members come to the aid of colleagues looking for hosting options in the U.K.
What affliliate program do you suggest? Members offer feedback on the different programs they've worked with. BetUS.com provides an excellent opportunity for affiliates to earn money simply by providing a link on your site to BetUS.com. For referring visitors to BetUS.com through your link, you will earn up to 35% of the net profits generated by the customers you referred.